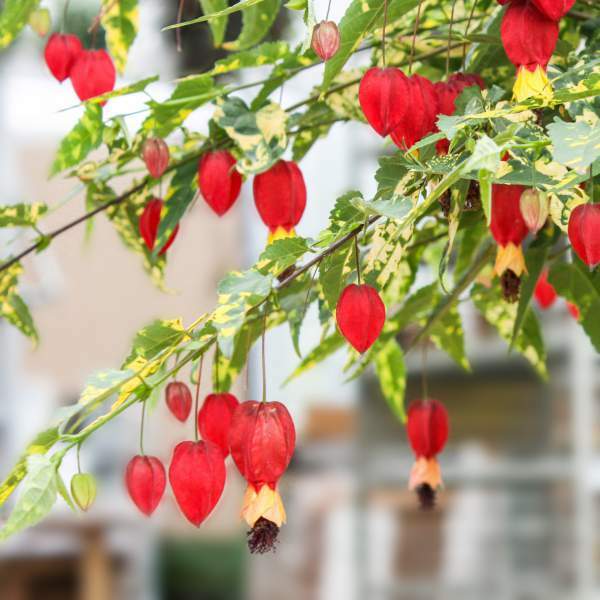 Chinese Lantern (Abutilon) is an excellent trailing plant for hanging baskets. Chinese Lantern have stunning foliage in the shape of maple leaves with green and yellow markings. Their unique red-and-yellow lantern-shaped blooms give the plant its name. Abutilon are evergreen perennials in zones 9-10 and can be grown as annuals everywhere else. Feed Chinese Lantern with fertilizers at 200 ppm N constant liquid feed program. Maintain a pH level between 5.5 and 6.5. Chinese Lantern is a naturally big plant. The ideal way to grow a compact basket is to keep it in a cool house in the winter with a temperature of 45 F and bring it to the a warmer house in the spring to flower. This is a process called vernalization and allows you to grow a nice compact plant due to cold temps, which then blooms widely when placed in warmer temps in the spring. Pinching is recommended due to Chinese Lantern's natural size. Shape the plant by continuing to pinch it back each month. Allow 4 weeks from the last pinch for plants to produce blooms. If you are looking to grow a big basket, space your hanging baskets wider than normal. 3 foot spacing would be normal for a grower looking to produce an oversized basket. Normal spacing for a stockier plant would be 2 feet. You can use growth regulators like Bonzi or B-Nine, as the plants will respond to the treatment, but we do not recommend any growth regulators on Chinese Lanterns. Control growth by growing the plants in a cool, bright area and pinching regularly. Scale and whiteflies are the biggest pests to watch out for with Chinese Lantern. Chinese Lantern are not prone to many diseases, but watch for botrytis in the early spring. This grey rot is usually associated with wet or humid conditions. You can prevent botrytis by allowing the plant to dry out between waterings, allowing for good airflow in your greenhouse, and spacing to allow the sun to penetrate to the soil level. The most common chemicals used to treat botrytis are Medallion and Banrot. Use them as a drench according to each label's instructions. We do not recommend Chinese Lantern for 4" pots as they would overgrow the pot too quickly. Plant 4-5 starter plants per 10" basket, and plant them deep so the top of our ellepot is slightly below the soil level in your container. It is especially hard to plant deep in a growing media with a high content of pine bark. Slow down the transplant line, and do it right. Pinching is not required on a natural season bloom schedule, but it will make a nicer, shorter, plant.